Fat Doctors Make Fat Patients Feel Better, And Worse : Shots - Health News Overweight patients say they feel doctors do a better job of weight loss counseling when the doctor's heavy, too. But they also say they feel more harshly judged by overweight doctors. The solution, researchers say, is for all doctors to be better trained to help patients manage weight. 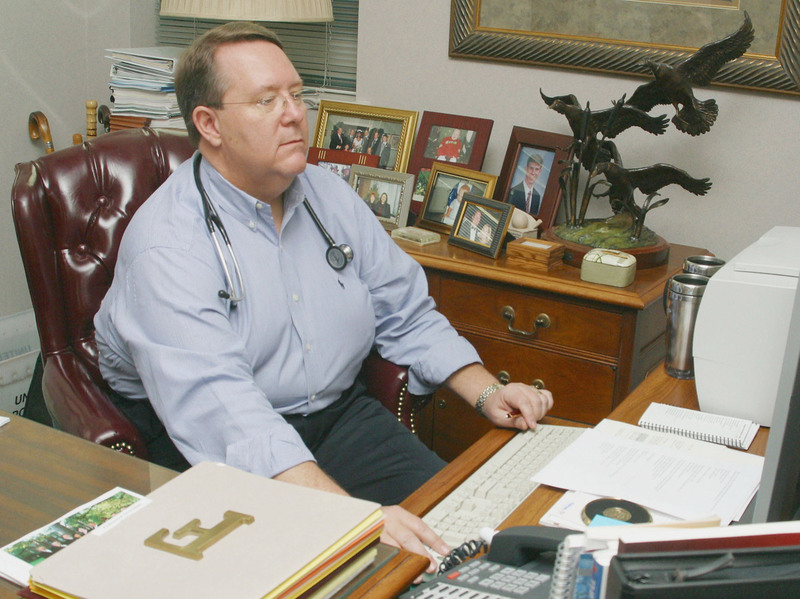 Dr. Michael Fleming, past president of the American Academy of Family Physicians, considered himself obese when this photo was taken in 2004. He led efforts by doctors to lose weight. People who are overweight or obese often feel like they're getting dissed by doctors. So you'd think that a fat doctor would understand. Well, yes and no. Patients are more apt to trust overweight doctors when it comes to diet advice, a study finds. But they're also more likely to feel that the overweight doctor is judging them about their weight. This contradictory bit of data is the latest to reveal the complex attitudes that doctors and patients have about weight and how best to deal with it. It could be that heavier doctors have been stigmatized themselves, and are then passing that along to their patients, according to Sara Bleich, an associate professor at the Johns Hopkins Bloomberg School of Public Health, and lead author of the study. Or "it could be that the patient goes in and sees a heavier doctor and feels that they are being judged." Sounds like there's more than enough bad feelings to go around. Overweight patients often ditch their doctors because they feel like they're being judgmental rather than helping with weight management, according to a study last month by other Johns Hopkins researchers. A study last year by Bleich found that overweight doctors are actually less likely to address a patient's weight issues, and feel less confident in counseling about diet and exercise. Odds are pretty good of getting a non-svelte doctor, no matter what you weigh. Bleich's 2012 study found that 51 percent of primary care providers are overweight or obese. That's a wee bit better than the 66 percent in the general population, but not by much. Overall, overweight people trust their doctors, whether they're fat or slim, Bleich says. The problem is that most doctors aren't trained in weight loss counseling, and they know it. So, being human, they avoid it. "If they don't feel equipped to deal with the weight loss issue, the patient is at a loss," Bleich says. That means the patient has to take control. "Take up the weight issue. Ask for advice. As for referrals if they don't feel the doctor is up to it." Her study was published in the journal Preventive Medicine. Primary care physicians are often unable to give good-quality counseling on weight in the short time of an office visit, Bleich says. That's why referral to outside specialists can help. Health insurance, including Medicaid, increasingly pays for programs like Weight Watchers, as well as counseling with nutritionists.